President Jung Myeong-seok of the Christian Gospel Mission opened a "Save the Nation" prayer meeting for the 95th anniversary of March 1 (Samiljeol),* and the celebration service for the Sports Department. Today's event was even more meaningful since President Jung prayed so much for his country. Moreover, the celebration was combined with the very first Sports Department meeting. This conveys the idea of giving glory to God first before any official sports event takes place. March 1st of 1919 is a significant day and it is celebrated annually in Korea.When Korea was colonized by Japan, the entire nation executed a peaceful protest for Korean independence on that day. Although they were mercilessly put down, this event provided a foundation for later independence movement. Based on President Jung's message 'even playing sports is giving glory to God,' about 1500 members associated with soccer, baseball, volleyball and more other sports, gathered together and had a time of becoming determined to maintain President Jung's mentality of loving the heavens. President Jung emphasized peace and harmony rather than focusing too much on competing to win. He engages people to interact through sports and struggles to create harmony in the world united as one. This idea contrasts from the sports competitions we see these days that are too centered on money or the desire of winning. The event opened with the cheerleading dance, which is the main spectacle of the sports field. All the participants became united, sang praises, and danced. Afterwards, Pastor Jung Beom-seok (Director of Wolmyeongdong Retreat Center) delivered a message on behalf of President Jung Myeong-seok and said, "I hope this day will be a day where we pray for the ones who lost their lives for this country. We have the responsibility to relay President Jung's mentality and life of wanting to be united through sports. Let us throw away our wrong perspectives and play sports in a new way." Also he added, "President Jung plays sports thinking of the opponents as his lovers. Let us make this message our priority and struggle hard to take action on it." This event was held to give glory to the Holy Trinity, who will govern this year's sports competitions, and also to reflect upon the true meaning of Samiljeol(March 1st). 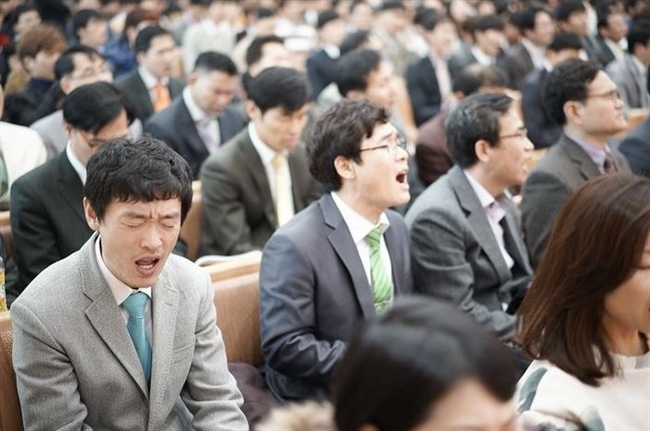 The event concluded with Pastor Beom-seok's tearful prayer. As the final schedule of the event, a certificate of appointment was delivered to each region's appointed association directors and secretary generals. Secretary General An Bong-gil of Kyung-ki region said, "I am so thankful to the Holy Trinity for allowing me to participate in such a meaningful event. I have made a resolution that we will have joyful sporting events this year. We have had the Save the Nation prayer meetings annually, but starting this year it was the first time having the Athlete's United Service. I hope that we can raise the level of these events even higher." Meanwhile, there will be club competitions starting from March.